The ubiquitous IM Jay Bonin attended today’s quads. Despite being the highest rated player in the section, he was unable to defeat the stubborn defense of FM Leif Pressman and they finished tied for first place. The second section was a very strong six player swiss. 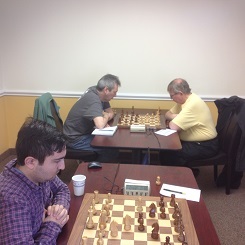 Local expert Raffaello Piccoli made a rare appearance and shook off the rust to win with a convincing 2.5/3 score. Daniel Cooper and Jonathan Baccay tied for second. Today’s third section was also a six player swiss. Top seeded Marcello Berger finished with a perfect score, propelling him well into the 1400’s! Thomas Ewald also had a good performance that was good enough for clear second.